Princeton Tec's Axis was designed to create one simple to use headlamp packing tons of functionality and allowing for customized light control for a variety of situations. The Axis features a simple, intuitive hybrid control system- a button to move you through red, spot and flood modes, and a dial to provide complete dimmability in every mode to help find the sweet spot for any task. 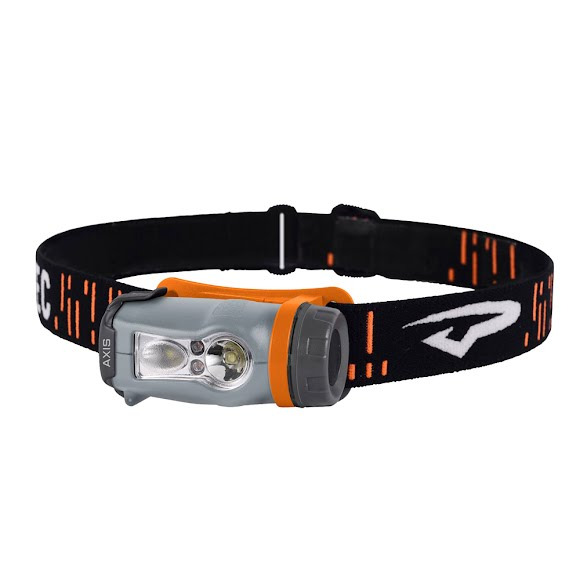 Princeton Tec &apos;s Axis was designed to create one simple to use headlamp packing tons of functionality and allowing for customized light control for a variety of situations. The Axis features a simple, intuitive hybrid control system- a button to move you through red, spot and flood modes, and a dial to provide complete dimmability in every mode to help find the sweet spot for any task. Whether it requires a long-reaching spot beam, night vision preserving and campsite friendly red mode and anything in between, the Axis has you covered. Single arm bracket design allows for secure beam angle adjustment and three AAA batteries provide a long-lasting and easy to replace power source. Dimmable LEDs provide the precise output needed for a given task, and help conserve battery power for maximum efficiency. Sometimes they use the word dimmability, which isn&apos;t exactly a word yet, but they&apos;re very fond of it and have faith it will become one. The highest quality LED available. Princeton Tec&apos;s Maxbright LED is extremely bright and efficient. This single LED emits a smooth, powerful, white light useful for a wide range of tasks. Princeton Tec uses collimators or reflectors with the Maxbright LED depending upon the application. Must yell MAXBRIGHT when saying term out loud. The Ultrabright LED is bright and efficient. The smooth, white, wide-beam light emitted by Ultrabright LEDs is ideal for close to mid-range tasks. Ultrabright LEDs are usually grouped together to offer a more powerful light source. Advances currently underway will continue to improve the efficiency and brightness of Ultrabright LEDs. Multiple settings on many of their products give you the flexibility to adjust your light&apos;s brightness to illuminate greater distances or to conserve battery power, depending on your needs.